Back in January, I attended a meeting of the Toronto Area Audiophile Society where several amplifiers fought it out in a rigidly controlled blind shootout. Truth be told, I have dubious feelings about quick A/B comparisons in a high-stress environment. They rarely, if ever, tell me how well a component will play music. If you are one of those people who believe that all amps sound the same, then shootouts such as this will only reinforce that belief. After five or six amps, I couldn't tell what I was listening to nor did I care. However, anything that lures audiophiles out of their basements to socialize is always a good thing in my book. Interacting with fellow enthusiasts is always preferable to fighting over the sweet spot. Sitting in on the event was Song Audio's Song Kim who patiently waited until this mind-numbing experience was over to bring out this little integrated SET and a pair of small single-driver speakers. As it was late in the day, most folks had left and there were only a few of us stalwarts around to hear Mr. Kim's little system. Once music started, a stream of four-letter words followed while jaws were picked off the floor. After spending an afternoon listening to the same half dozen tracks ad nauseam over several amps and a pair of multi-way speakers, listening to this wee system in a completely relaxed environment was revelatory. What this rig lacked in full-range sound it more than made up for in immediacy and transparency. It was downright scary. Here was a system that appeared to deliver what just about everything else we heard that day had completely missed. Needless to say, I approached Mr. Kim for a formal review. The Song Audio Cecilia Edition is the upscale successor to the SA-34 SB I reviewed four years ago. On appearance alone, the newer model is a distinct upgrade over the original. Out with the chrome and in with stainless steel, fancy protective rings for the tubes and a nicely finished pale green acrylic front panel. 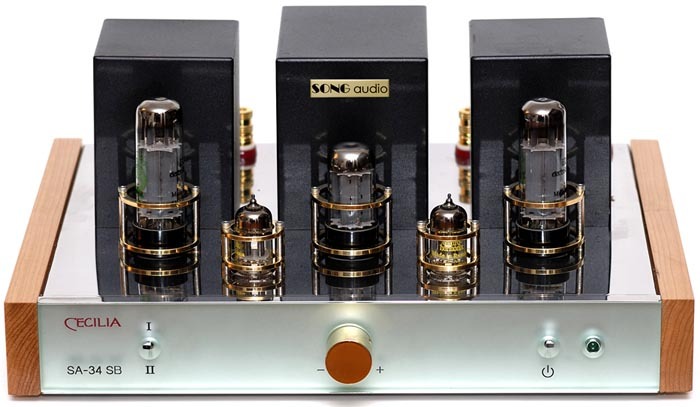 The Cecilia is a single-ended triode design featuring zero negative feedback. Tube complement consists of a pair of Electro-Harmonix EL34 pentodes strapped for triode operation, two EH12AX7 for the driver stage and a single 5AR4 for rectification. The circuitry and transformers are proprietary. Power output is 4wpc at less than 3% THD plus noise. The Cecilia features an auto biasing circuit, therefore manual adjustments are unnecessary. The preamp section of the Cecilia is a passive line stage with two line level inputs and a pair of variable line level outputs for subwoofers. Gain is via a 100 kOhm Nobel potentiometer. The two toggle switches on the front panel control power on/off and source selection. The chassis is mirror-polished stainless steel with solid Cherry side panels. The volume control, logo and metal rings protecting the tubes sport 18-karat gold plating. Power connection is via rear-mounted IEC. Interestingly, the Cecilia ships with a custom 2m cryogenically treated silver-coated copper power cord fitted with Furutech connectors. Mr. Kim indicated this cable would retail for $500 if sold separately. Warranty is five years parts and labor for the original owner and the tubes get 90 days. Speaker outputs for both 4 and 8-ohm loads are color-coded gold-plated five-way binding posts. Both low-level inputs and outputs are gold-plated phonos. Overall build quality is good. Some may balk at the considerable price increase over the SA-34 SB, however the Cecilia is completely assembled in Canada whereas the SA-34 was mostly outsourced off shore. I asked Mr. Kim why he chose a pentode like the EL34 and not a real triode such as the 300B, 2A3 etc. He replied, "I found the EL34 vacuum tube to be one of the most musically sounding tubes when used in SET operation with no negative feedback, with one shortcoming - low power. It is very hard to produce enough power to satisfy the majority of music lovers. That is why there are so few integrated amps in this particular category. The Cecilia will produce enough volume for listeners in average home environments when using 90dB+ loudspeakers." The Loth-X Ion Amaze sports a 6" dual-cone paper driver in a Cherry-veneered cabinet with truncated transmission line loading. The Amaze measures 16" x 8" x 12" (H x W x D) and weighs in at about 13 lbs. Claimed sensitivity is 96dB/2.83 V/m, impedance is 8 ohms and the -3dB point of bass response is 70Hz. As some of you might know, Singapore-based Loth-X ceased operations some time ago. However, Song Audio purchased the remaining stock and is currently offering them at a discounted price. The Amaze is an attractive, nicely finished speaker with a pair of decent gold-plated binding posts. Mr. Kim hinted that after clearing the remaining Loth-X stock, Song Audio will probably offer its own line of single-driver speakers. For the review, Mr. Kim also included a pair of DNM speaker cables which at $8 per foot should be an excellent choice for a small system such as this. The DNM was sonically unobtrusive, with smooth grain-free highs and a beguiling sense of pace. Perhaps it didn't display the same degree of musical information as my Auditorium 23 or the SilverFi Sufi I have in for review but considering the bargain basement price, I don't have any complaints. For interconnects, I settled on SilverFi's Moonshadow. I'll have more to say about these attractively balanced yet revealing cables from Turkey in a future review. Since the Ion Amaze is a small speaker with little output below 70Hz, Mr. Kim recommends mating a subwoofer to this system. As my REL emitted a loud hum with the high and low level inputs, Mr. Kim loaned me a PSB SubSeries 1 sub which retails for $349. I placed the amp on my Grand Prix Audio Monaco rack and the speakers on a pair of sand-filled Skylan stands. I tried the Amaze in several locations and preferred them firing down the long dimension at least two feet out from the back wall and spread apart approximately eight feet and slightly toed in. I tried several power cables but kept coming back to the custom Song Audio cable. In terms of dynamics, smoothness and bass reproduction, I thought it was just about perfect for this amp. Upon firing up the amp, I noted a considerable degree of low-level hum and noise through the speakers. When using tube amps, I generally expect to hear some noise but this was far too high and clearly audible during playback from my listening seat. When I added the PSB sub, the noise increased yet further. Additionally, the level on the line outputs was so high that I had barely a quarter inch of usable volume on the sub. Thus dialing in the sub was nearly impossible. When I did manage a decent degree of integration, the PSB did not impress at all. Even when inserted into my Manley Labs/Green Mountain Audio rig, I was constantly aware of the sub chuffing and chugging away down low whereas my REL all but disappears when set up correctly. The PSB I'm sure is a decent budget sub primarily suited for HT but it was clearly out of its depth in my system. Unfortunately, the experience continued to spiral downward. I discovered sound continuing to emanate from the Loth-X monitors even with the amp turned off. I'm at a loss to explain why this occurred. I can only surmise that there was an unresolved wiring issue with my review loaner. When I mentioned my hum and sub issues to Mr. Kim, he loaned me a Velodyne CHT-10 sub which he thought might be a better match and perhaps quieter than the cheaper PSB. The noise with the Cecilia switched off while connected to the PSB was now gone. However, there was still an increase in hum via the speakers when the sub inserted into the system. Plus, the amp's output level was still too high to effectively control the Velodyne's volume. After a phone conversation, I returned the amp to Song Audio. Something was clearly wrong. Several days and a second review loaner later, Mr. Kim gave me a third sample with a considerably attenuated line output. Ah, this was much better. The noise level was reduced down to a more than acceptable level. In fact it was only just barely audible when music wasn’t playing. Frankly, I’ve had solid state amps that were noisier. Furthermore, my REL Q108 no longer emitted a loud hum when connected to the Cecilia. I also had plenty of play on the sub's volume to optimally match it with the Amaze monitors. Oddly, this third amp version also sounded slightly better than the other two. The midrange appeared slightly richer. Unfortunately, I discovered that the right and left channels of this unit were reversed. One other concern I'll mention is packaging. The inserts are woefully inadequate to withstand the mysterious forces that cause some boxes to be drop-kicked off the back of trucks. I strongly recommend that Song Audio find a more robust packaging material. in smaller rooms. And it didn't fair too badly with large-scale material either. However, you'll definitely want a sub with these speakers as there is little if any bass. Therefore, I kept my REL Q108 on hand for the remainder of this review. If you are looking for a warm, lush, romantic sound, you won't find it here with this combo. Sonics were remarkably clean and clear and direct. Many folks seem to think SETs are overly warm and syrupy. Nonsense. However, they certainly can be if voiced that way or matched with the wrong speaker load. Matched correctly, good SETs sound remarkably nimble, transparent and eerily holographic. The Loth-X Amaze would seem to be an ideal match on paper - 96dB sensitivity, single driver, no crossover and an 8-ohm impedance. Indeed, it was ideal in many respects. I noted plenty of jump factor with this combination and an almost hypnotizing directness and lit-from-within transparency. Transients were quick and clean. The Cecilia displayed impeccable timing and let music ebb and flow effortlessly. The treble region was, for the most part, grain free and smooth. However, female vocals could sound a little spitty and overly bright recordings were intolerable. After swapping in various speakers and amps, I confirmed that the Amaze was the culprit. While sounding excellent with decent records, the Amaze possesses a slightly tipped-up balance that tended to underline the highs. Thus already bright recordings had nowhere to hide. I suspect this was a result of the 6-inch driver distorting as it tried to reproduce high frequencies. This distortion was clearly audible on several recordings. As many full-range mavens would say, "Never send a woofer to do a tweeter's job". Unfortunately, then you'll lose that immediacy and transparency single drivers are renowned for. Keeping the volume at a respectable level and leaving the speaker grills in place helped nullify some of the sting. The Cecilia/Amaze presented a well-proportioned, velvety, slightly diffuse soundscape where each musical strand was clearly audible but without the razor-sharp exactitude I noted with several multi kilo buck über systems at this year's Le Festival Son and Image in Montreal. To me, that's just sound effects. Music playback via the Cecilia regardless what speakers I used was deliciously natural and completely devoid of artifice or any electronic signature whatsoever. The midrange and rightness of timbre -- as can be expected with a single driver speaker and SET amp -- were where this combo excelled. With a guitar, I heard more of the natural sound of the instrument and more details like the sound of fingers sliding over the frets (or the subtle intake of breath before a vocalist sings). Part of this might have been due to the reduced parts count of SETs and by not phase-splitting the signal and then recombining it. Perhaps less is more. Some of the better chip and Class T amps such as Audio Zone's Amp-1 and RWA's Signature Series come awfully close to the virtues of SETs like the Cecilia but just miss that last bit of texture and palpability. The trade off is loudspeaker compatibility. Low-power amps generally require highly efficient speakers, often preferring single-driver designs. However, not all listeners can tolerate their sonic signatures. Listening to CPE Bach's mini Symphonies [Harmonia Mundi HMU 907403] was revelatory. The string tone was ravishing, full of vibrancy and life. It was easier to listen into the performance and get caught up in the brilliance of Bach's music. It also helps when the recording quality matches the performance as it does here. Music over the little amp was purer, sweeter and more transparent than my Shrimp/Mahi combo. The later also lacked the same degree of vibrancy and aliveness. On the other hand, the Cecilia lacked the weight, gusto and loudspeaker compatibility of the Manley trio. Beethoven string quartets [Calliope CAL 3633/39], Pat Martino's El Hombre [Prestige PRCD-30158-2] and Venezuelan Antonio Lauro's exotic guitar music [Naxos 8.554348] all sounded natural and real as did Holly Cole's take on Tom Waits [Alert Z2-81026], which was simply scary in its presence and immediacy. It was remarkable how well this combo created the illusion of a human voice between the speakers. A recent treasure trove of a find was a budget-priced box set from Stax [STX2-30203-2]. Carla Thomas, The Staple Singers and Otis Redding rubbed shoulders with Isaac Hayes and Booker T and the MGs. What a great set. According to the liner notes, Stax generally recorded live in a converted movie house with no overdubs. That live off-the-floor vibe as well as the sound of the hall were clearly audible with the Cecilia/Amaze combo which just enhanced the listening experience. What didn't work with this combo were large-scale orchestral fare and hard-hitting rock recordings. Mahler's 8th [Naxos 8.550533.34] ran out of gas during orchestral climaxes while Mission of Burma's Onoffon [Matador OLE 613-1] and Naked Raygun's Jettison [Caroline CAROL-1348-1] sounded far less menacing than they should. On my Manley system, they growl and snarl like a pair of ill-tempered grizzlies. On the other hand, a rock recording like the Stones' Exile on Main Street [WEA COC 2-2900] was damn near perfect. The layers of shimmering guitars, buried vocals, sleaze and wonderful feel that were so clearly palpable here just reinforced my opinion that this is the best Rock'n'Roll record ever. Heck, after a session of Exile on this combo, I was ready to down a bottle of Wild Turkey and shoot up a speedball. Mozart's late Symphonies [Philips 470 540-2] were also rendered similarly tactile - minus the sleaze and drug abuse of course. It was all very prim and proper. This combo perfectly portrayed the spacious, slightly reverberant acoustic of the Lukas Kirche and the lovely ethereal yet textured strings of the Staatskapelle Dresden. I am not exactly a big fan of Mozart, however, it was darn near impossible not to be drawn into the music with this system. What bass this pairing did possess was solid, well controlled and went as deep as the Amaze permitted. There just wasn't much of it. The Cecilia offered a more refined, extended top end and greater bottom end extension over my GMA Callisto. However, I didn't get the same sense of immediacy and transparency as with the Loth-X speakers. Another fine match was Ed Shilling's Horn which possessed all the speed, agility and directness the Amaze did but offered a slightly more forward presentation and fuller bass. I don't want to be overly critical of the Amaze as I found it to perform quite well in a smaller room with the speakers placed right up against the wall and with a careful choice of music. I also tried the Cecilia in my dad's system which features the JM Reynaud Twin Signature loudspeakers and the Audio Space Mini-2 EL34 integrated. The Cecilia experienced little difficulty in driving the Reynauds to acceptable levels and beat the Mini-2 in transparency and transient fidelity. Lightning-quick percussive material such as Flamenco guitar was more incisive and vibrant with the Cecilia than the Mini-2 which tended to overlay a touch of honey and autumnal glow. Oddly, it's the latter that many mistakenly attribute to SET sound. $3,500 Canadian may seem a considerable sum for a 4-watt amp but what you'll lack in testicular fortitude and loudspeaker compatibility you'll make up in immediacy and naturalness. I'd stay clear of speakers under 92dB and multi-ways with high-order crossovers. Now that the excessive hum I noted in the two previous samples has been resolved, the only two reservations I have are the packaging and consistency in quality control with respect to the reversed channels on the third sample. Knowing Mr. Kim, I’m sure he’ll have those concerns addressed by the time you read this. Otherwise, the Cecilia is a fine-sounding if expensive SET integrated that uses a simple circuit in a unique and nicely finished chassis. It is a visual delight, especially with the pale green front plate contrasting with the soft orange glow of tubes reflecting off the polished stainless steel enclosure. Despite the problems I encountered, it was a joy to hear and rekindled fond memories of its predecessor I reviewed in 2003. My system has changed considerably in that time, therefore I'm unable to offer any meaningful comparison. However, upon re-reading my review, I can tell you that the Cecilia certainly offers at least the same degree of "wanton debauchery" as did the SA-34 SB. For music lovers with small rooms and a penchant for acoustic music, the Amaze is certainly worth considering. However, if you value greater weight and bass extension, you'll want a sub or a bigger speaker. If you don't own or want a sub, then I suggest positioning the Amaze only a few inches from the back wall, preferably firing across the short dimension of your room. With the boundary effect adding a touch more bottom end, you might not need a sub. The Cecilia/Amaze isn't about pretty graphs and impressive looking specifications. Unlike the super expensive rigs where the bottom line is scale, detail, wall-shaking bass and chiseled images, the Cecilia/Amaze duo travels down a more holistic road where the end results transcend the sum of its parts or its unsexy technical specs. It all comes down to conveying the emotion and intellect behind the music as well as realizing the natural ebb and flow of music. Forget the HiFi stuff; this little system just might tug at your heart strings as opposed to stroking your macho big-rig ego.